Yesterday, UK media personality Jodie Marsh - a glamour model and bodybuilder - posted this video of herself on Facebook reviving her lifeless Bulldog, Louie. It's already been seen by millions. Jodie revealed in the comments that this dog collapses every two months or so and each time she has brought the dog back from the dead by doing what you see above. Moreover, she tells everyone to watch because one day it may save their own dog's life. Her fans think she's a hero. I think she's irresponsible and a danger to dogs. Despite this being a regular occurrence, Ms Marsh shows no sign of having availed herself of the many dog first aid courses available that show owners how to do this properly (see bottom of page)..
How do I know this? Because she has the most basic tenet of it wrong: you don't do mouth-to-mouth resuscitation with dogs - you do mouth-to-nose. This is partly because it is impossible to get an air-tight seal on a dog's mouth - but also because dogs don't breathe through their mouths: they breathe through their noses. Now dogs are not quite the obligate nose breathers horses are, but dogs only breathe through their mouths - and very inefficiently - if they are not able to get enough oxygen in through their noses. If you block off the nose on a normal dog, they will go into a meltdown panic. Jodie is clearly managing to bring her dog round each time he collapses, and she is doing the right thing in clearing the blockage from his throat, but she is putting her dog at further risk by doing the rest of it wrong. Wiggling a limp dog's body about a bit while blowing air into a dog's mouth is not CPR. The danger is that in copying what she does, rather than what they should do, a dog that would otherwise live will die. Jodie isn't totally clear what causes the dog to collapse so often - she mentions that the dog choked on a treat this time, but also refers to overheating and to 'tracheal collapse'. All are common-enough in Bulldogs and other brachycpehliac (flat-faced) breeds - as is keeling over from exertion or stress. However, she says the root cause is that the dog has an elongated soft palate that blocks his airway. This, too, is very common in Bulldogs and is the reason why so many sound like a freight train. The technical name for this sometimes-life-threatening laborious breathing is "stertor" and the sole reason Bulldogs and other brachycephalics suffer from it (and other airway compromise) is because humans think it's cute to breed a dog with no muzzle, essentially crushing all the flesh that would be appropriate for a longer muzzled dog into a much smaller space. There is surgery to fix this that can transform these dogs' lives. 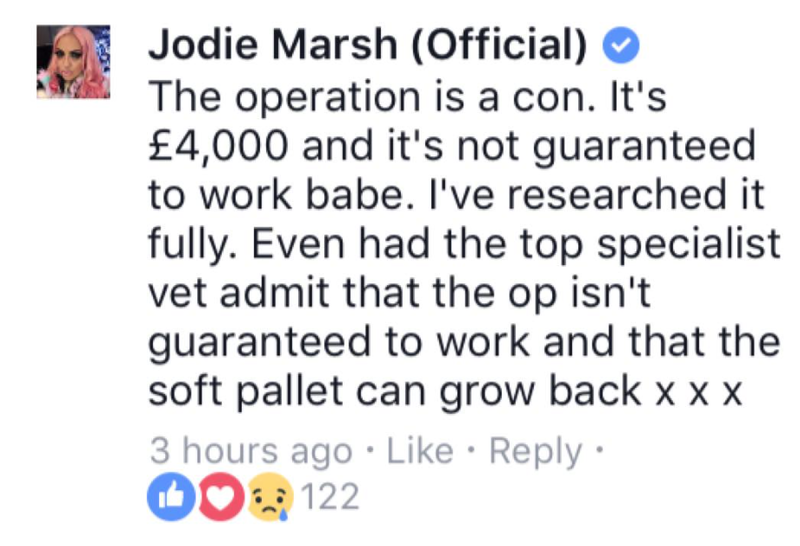 But, worryingly, Jodie reveals on her Facebook page that she thinks the operation "is a con" and claims it costs £4,000 (about four times the average real cost). Instead she would prefer a life of respiratory compromise for her Bulldogs (some of which she admits have died at three years old). Bulldog Louie is a 13-yr-old rescue and anaesthesia has risks for Bulldogs and older dogs, so one can understand why Ms Marsh has not opted for surgery for this particular dog, although it would have been less of a risk two years ago when she first got him. What a kindness it would have been for this dog who has to be watched like a hawk every time he eats or when out for a walk in anything other than cool weather. It is true that the surgery is not always 100% successful - but in the majority of cases it offers at least some respite (and often a great deal of relief) to these dogs. It is, at best, irresponsible to put others off what can be life-saving surgery. At worst, it could lead directly to another dog's death. 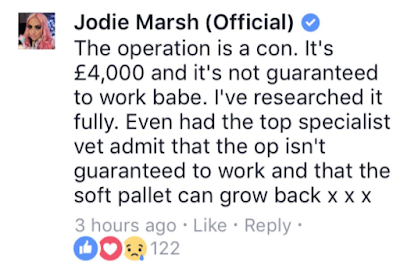 Jodie claims it's a con because the soft palate grows back - in fact not true. Scarring from the op can go on to cause problems later on, but modern techniques minimise this. “No dog should have to endure the distress of regularly collapsing, though sadly this is a reality for many flat-faced dogs. We would strongly advise anyone with a pet suffering these symptoms to talk to their vet urgently to agree the best way to ensure the health and welfare of their pet. This may include opting for surgery and will definitely include taking special measures in hot weather. Ms Ravetz also commented on the use of CPR on dogs. Check there is nothing in the throat. If the dog is not breathing, extend the dog's neck, close the mouth and blow down the dog's nose, using your hand as a 'funnel' so that you do not directly contact your dog's nose. Apply regular, intermittent gentle pressure to the chest if you are sure there is no heartbeat. Jodie clearly loves her dogs - and has two perfectly sensible Rottweillers. It always astonishes me that people who are obsessed with their own looks and take so much trouble to keep fit are drawn to Bulldogs. Whatever the reason, she needs to think carefully about continuing to inflict air hunger on dogs she loves when a veterinary surgeon's knife can relieve the suffering. Better still, she should stop supporting the breeding of Bulldogs in their current, compromised form. Yep, even rescuing them plays a role in perpetuating their existence, especially if you're a celebrity. For more info on Bulldog breathing issues, check out the Cambridge BOAS Group's website here. If you would like to learn how to save your dog's life in similar circumstances, please check out the excellent courses from Dog First Aid UK. Looks like Jodie has accepted an offer to do a proper first aid course... Great news. Very sadly, Louie was found dead in Jodie's garden today. RIP Louie... May you be re-incarnated as a dog with a muzzle. I've often thought that the pretty person / athlete obsession with bulldogs is some version of the bridezilla / homely bridesmaid thing. In which an insecure narcissist chooses as wedding attendants "friends" she considers fat 'n' ugly (she is not generally correct about this) and outfits them in hideous costumes in order to ensure that she will outshine everyone around her and dominate "her day" without rival. You pick a sad deformed dog and people think you're pretty? I dunno. I get my rocks off seeing my sound, happy athletes perform improbable feats of usefulness and joy. But that's just me. So if you discourage rescuing, what is the fate of these dogs that have been given up? At least in the short-term or unless/until the breeding of such unhealthy types of dogs is halted, which is unlikely to be any time soon? Celebrities could simply adopt WITHOUT posting lots of photos of their brachycephalic rescues on social media, with lots of captions gushing about how "cute" craniofacial deformity in dogs is. This would avoid raising demand for these breeds. Alternately, they could use their unfortunate dogs as an opportunity to raise public awareness about the suffering caused by breeding for fashion and to advocate for reforming breed standards and dog show judging. Maybe they could pair every photo of their dog with a photo of a dog with a healthier confirmation, or a photo/painting of what the breed looked like before conformation shows began. The point of the post was not to discourage rescue. That was one line, to the side, aimed particularly at celebs. Hopefully, in the long term, their fate will be to remain unborn as people stop torture breeding. 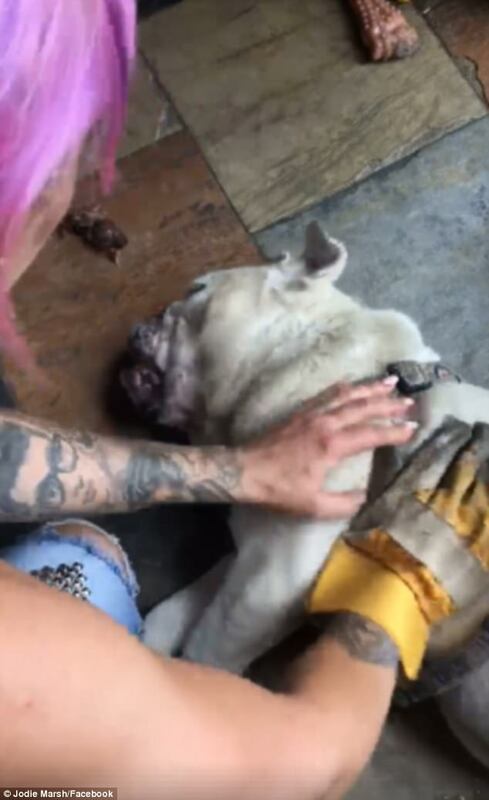 Celebs parading bulldogs make it more fashionable to have one of these sad monstrosities and help perpetuate bad breeding practice. Let's hope her dog collapsing on a regular basis is enough to frighten some people off bulldog ownership. We can hope. I hope so but I doubt it. The "it won't happen to me" mentality is very strong in today's generation. BTW, some articles say that Jodie rescued Louie 11 years ago, when he was two. Apparently, he's only needed periodic resuscitating for the last two years. Based on the photos, he does seem to have fairly open nostrils. Maybe that's why he managed to reach 11 years of age before having severe breeding problems? Such a sad thing, why cant people get it through their heads that these dogs are damaged and should be fixed to make them not suffer. You know who the real heroes are? People who refuse to perpetuate deformity like brachycephaly in the first place. Poor Louie. All of this - all of it - could have been prevented if people didn't intentionally breed birth defects into animals at all. He lived to be 13, not such a bad age for any breed.